Although a plethora of players has already been revealed to be engaged in the haemostatic system, a fundamental consideration of the molecular nature of information coding can give further explorations of the mechanisms of blood clotting, platelet functionality and vascular trafficking direction. 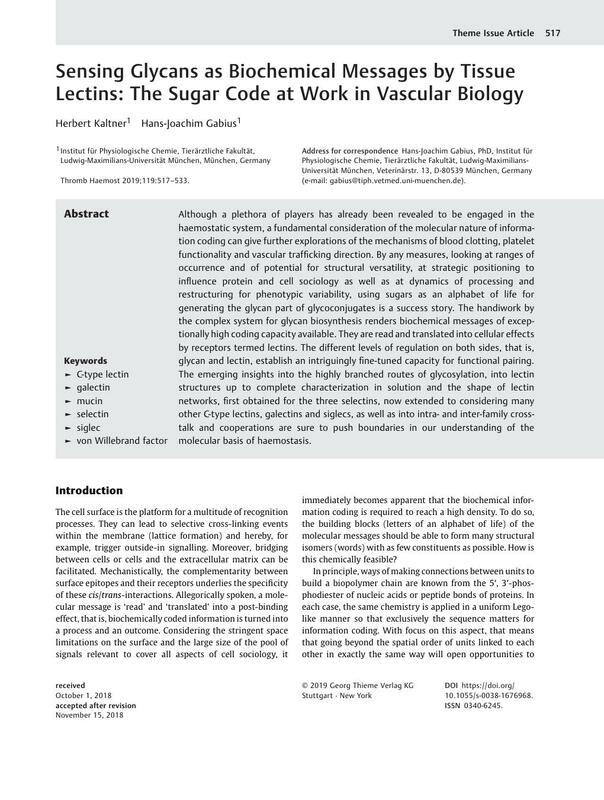 By any measures, looking at ranges of occurrence and of potential for structural versatility, at strategic positioning to influence protein and cell sociology as well as at dynamics of processing and restructuring for phenotypic variability, using sugars as an alphabet of life for generating the glycan part of glycoconjugates is a success story. The handiwork by the complex system for glycan biosynthesis renders biochemical messages of exceptionally high coding capacity available. They are read and translated into cellular effects by receptors termed lectins. The different levels of regulation on both sides, that is, glycan and lectin, establish an intriguingly fine-tuned capacity for functional pairing. The emerging insights into the highly branched routes of glycosylation, into lectin structures up to complete characterization in solution and the shape of lectin networks, first obtained for the three selectins, now extended to considering many other C-type lectins, galectins and siglecs, as well as into intra- and inter-family cross-talk and cooperations are sure to push boundaries in our understanding of the molecular basis of haemostasis.